The moment you chose the U of A, you became a member of our alumni community—260,000 vital and passionate people who share their talents across Canada and around the world. The Faculty of Kinesiology, Sport, and Recreation has graduated over 4,000 alumni in our 50+ year history. We are proud of the accomplishments of our alumni and the difference many of them make in their community. KSRAA - The faculty’s alumni chapter, is a volunteer driven association committed to keeping alumni in touch with each other and informed of news and developments in the faculty. Find out about upcoming opportunities to get together with fellow alumni in your area, as well as past professors and current colleagues. You haven't aged a day! Take a walk back through memory lane and bad hair days with our Class Pictures. Find out how you can help the KSR invest in the best and brightest students and faculty and support world-class research and teaching. Every year the University of Alberta honours their former students and welcomes them back to campus with a full slate of events for alumni weekend. In addition to the many events Alumni Relations organizes, the Faculty of Kinesiology, Sport, and Recreation will host a number of their own activities. Contact us for information on becoming a class organizer and getting your classmates together for Alumni Weekend 2019. Alumni Breakfast - Celebrating our 15, 25, 30, 40, 50 and 60 year grads! Let us host you and a guest at the Royal Mayfair Golf and Country Club. 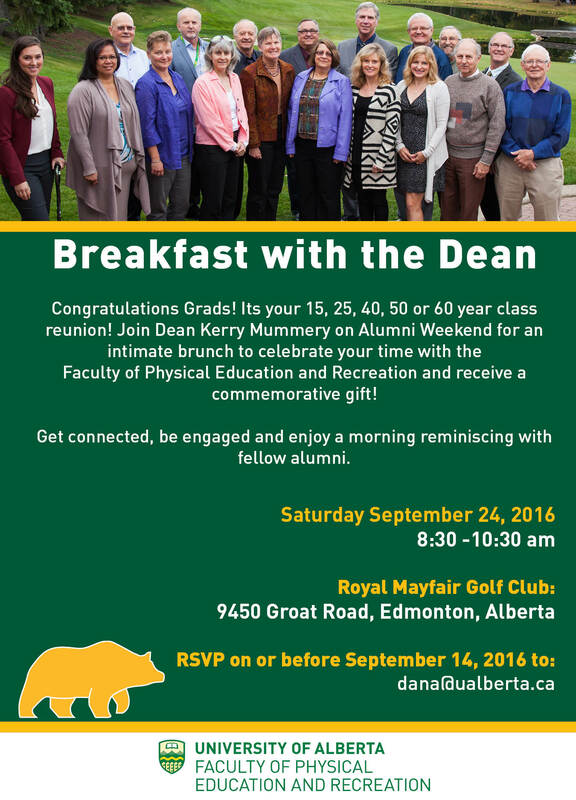 To RSVP email dana@ualberta.ca by September 10 - special invitations will be sent out this summer.